This is the first in a series about auctioneers seeing or increasing bids. A second post will discuss absentee vs. maximum bids in service terms. The last questions the need to see or raise bids if auctioneers know coins in the first place. 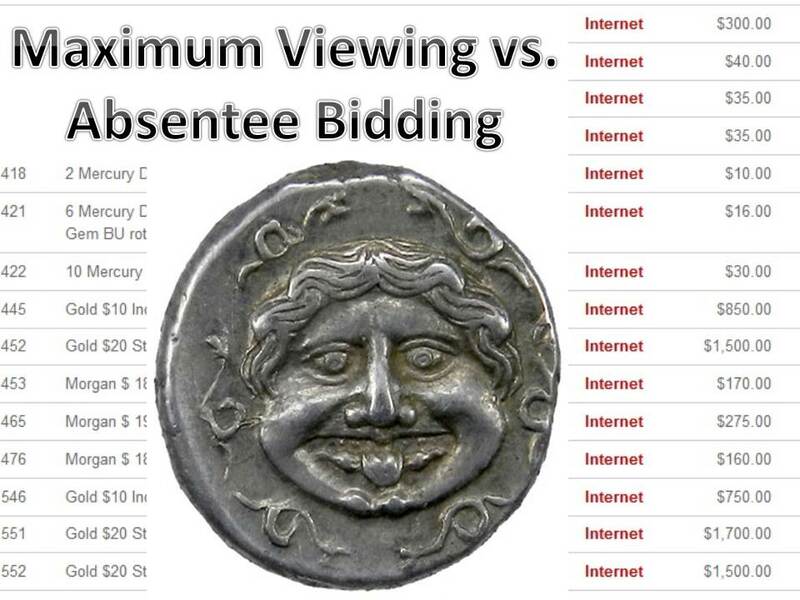 A few Proxibid auctioneers have communicated to us that viewing maximum bids is the same thing as accepting absentee bids. It is decidedly not. An absentee bid is conveyed via email, text or telephone (and, in some cases, through private online registration of the auction company). A maximum bid is conveyed via the portal. In person, attending the auction onsite. Via a portal, leaving a maximum bid. Via the auction company, using an online form that bypasses Proxibid. Via written absentee bid, sent, emailed, texted or faxed to the auction company. Via telephone bid, through a company employee. An absentee bid is an offer independent of any opening bid or reserve. In other words, if an auction house opens with high bids but then sells during the auction at any winning level, an absentee bidder can secure the coin below the opening high reserve, knowing he will not be present during the live session onsite or via Internet. In the past, Proxiblog has sent opening bids via email to auction houses and won coins below opening levels. Conversely, Proxibid receives a fee when a coin sells via a maximum bid, and the technology raises those bids by set increments. Many buyers object to auctioneers seeing maximum bids because the temptation to increase the bid to the max exists with nothing but the auctioneer’s word that he or she won’t. Then doubt sets in. Often, a coin will sell at a maximum bid legitimately; however, when the maximum is reached, the buyer has a lingering suspicion that the house deceived him or her by jumping to the maximum without doing so by increments. Proxiblog does not bid with confidence at any auction seeing maximum bids, even if that house is listed as a top one on our blog. We have tested houses, as this post notes. Rather, we will bid Grey Sheet (or wholesale) and take pains not to bid higher even if a competitor has the top bid (and we know all our competitors, despite Proxibid’s trying to hide those by printing only the first and last letter of the user name). Seeing maximum bids just plain hinders competition. In our second post, we will explore service terms of houses allowing absentee bids while not allowing maximum bid viewing. In our third post, we will provide ways for auctioneers to eliminate maximum- and consignor-bidding and challenge them to try our methods, comparing results. This entry was posted in Articles, Best Practices, Featured Updates, News and tagged absentee bids, American Numismatic Association, Auctioneers, Best Practices, Coin Auction, iCollector, Maximum Bid, National Auctioneer Association, Proxibid, Proxiblog. Bookmark the permalink. We ran our test last night, in anticipation that this was not a closed issue. 🙂 We listed 450 lots Sunday night for our coin auction. Here are the results: 26 lots sold at or below the initial maximum bids. Of those, I was able to set increment levels that would make sure the high bid was not matched or missed. I did have a lot tie due to my increment level mistake and the live bid took the lot from the prebid. I will have to pay closer attention to that. The remaining 424 lots sold over the maximum bid from the start of the auction. It has been our experience that the maximum prebid rarely wins the lot and usually does so on a low level lot as happened last night. Again, I would need substantial proof that Heritage, Teletrade, and Great Collections, which all own their own software, do not have access to maximum bids. The advantage to our company is to ensure that bidders maximum is represented by the smallest increment to not leave a high bidder short of the winning sale. Also, to place increment levels appropriately to ensure there is not a tie, in which the win goes to the most current bidder. Of course, we are 100% online only bids. We do not allow onsite bidding or absentee bids which would require me to hit the onsite button to run a bid to the next level. Proxibid can give you the lot information if you ask. We will also tell you who and where the bids come from that were in a given lot. Keep up the good fight Michael. Good points! Our bidders respect the integrity and manner in which we run our auctions. Suspicious? Bid Live! That is what we say! 🙂 Happy thoughts from the lower corn fields of Iowa! You’ve always performed in this respectful manner, Charles. I will have some recommendations later in the week. Also, concerning Heritage and Teletrade, I learned something inadvertently. I neglected to put minimum bids on some lots that sold 40% under wholesale; but was informed by Teletrade that the lots would not sell at those levels because they were far too under Grey Sheet. I didn’t know that was monitored technologically. Thanks, as always, for your comment.